Spot the new Moneta…. | More blue fabric? 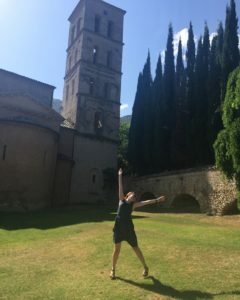 How can you not jump for joy in a former Italian abbey? 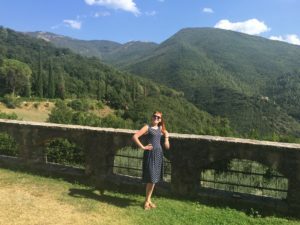 It’s no secret that I love Moneta, and it’s quickly become a regular sew, especially since I discovered that I can get a dress out of just one metre of fabric with a bit of wiggling. So it was no surprise that when I spotted some polka dot fabric on a trip to the rag market hosted by Rach that I quickly snapped some up ready for a light and breezy summer dress. A thin lightweight jersey from an outdoor stall at the rag market; it was a bargain too, costing only £1.50! Seriously, the view from this place was amazing! The fabric was printed ever so slightly squiffy which meant cutting out pieces so that they would line up was a bit of a nightmare. Luckily it’s nothing that couldn’t be sorted with a quick application of some scissors! I wouldn’t say never, although now that we’re moving into autumn I might look to make a few more sleeved versions of the dress. That said, I have a freaking huge list of to-be-mades at the moment so unless it’s a truly truly fabulous print I think it’ll be a while before I make another. Next > The green dress of doom….